Giant babies are coming to Palm Springs, for some reason, and I am just going to go ahead and say it: I don’t get it. The Desert Sun, after spending time spying your posts and forgetting about the millions of Instagram photos taken of a certain mirror house, proclaims these giant baby statue things with no faces will be bigger than the cheeseball Marilyn statue. Judging by the conversation on Facebook so far, this is going to be the next biggest must-see, must-photograph art installation since “Forever Marilyn,” before she left to make way for the downtown revitalization project. “The 10 Babies,” created by rebel Czech Republic artist David Černý, are currently in storage behind the Rowan Hotel in an underground sandpit where residential units will eventually be built part of Grit Development’s downtown project. 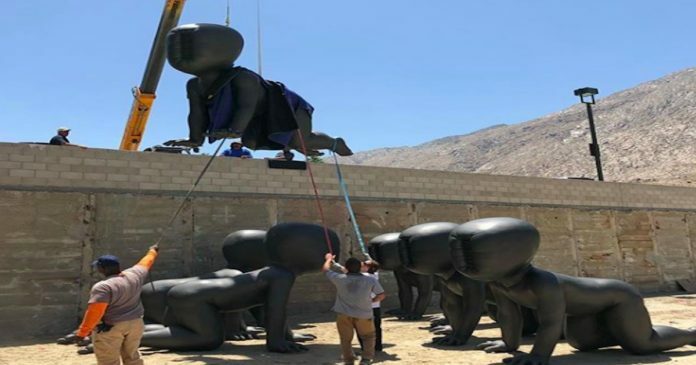 But until construction begins, the “Babies” will be set up in this area, in front of the Palm Springs Art Museum, so people looking down into the pit – especially from the hotel’s rooftop – will see them crawling about. First off, they built the walls so high on that rooftop, you really can’t see anything. Second, seriously, wtf? I am no art expert, but the whole thing just seems so forced. HEY, GUYS. HERE ARE 10 BABIES. AND THEY HAVE NO FACES! AND THEY ARE CRAWLING. NO SERIOUSLY. TAKE PICTURES. TAKE PICTURES NOW!!!!! AND PLEASE TAG THE HOTEL BUILT ON SCANDAL ON THE ‘GRAM. The babies will be put out and about in some form in June and, who knows, maybe they end being the biggest, best, and most spectacular thing to ever happen to Palm Springs – I just wouldn’t put any money on it, not even $375,000 from a hotel developer. Feel free to change my mind in the comments.